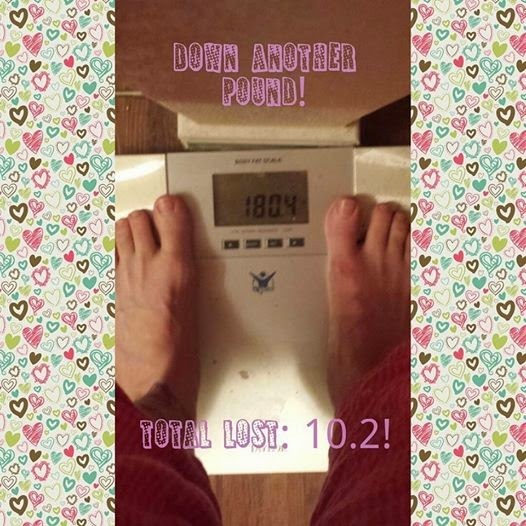 I'm down another pound! Woohoo! Not as good as previous weeks, but I actually had a feeling that I might have lost nothing at all this week, so I'm happy with 1 pound. But, to be honest, I was really hoping to be in the 170's today. As a result, I've adjusted my daily calorie goal from 1900 down to 1700. I've been feeling like the amount of food I've been eating to get close to my 1900 daily goal just seemed like a lot, so this needed to happen. 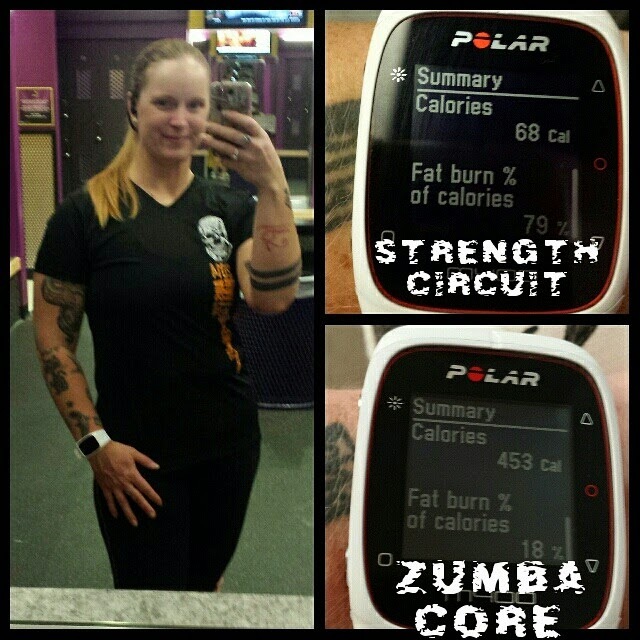 • Saturday: went to the gym and then came home and did some Zumba. • Sunday: ran 20.5 miles. It wasn’t easy either. I’m pretty sure (like 85%) that I didn’t hydrate as well as I should have on Saturday. Oops. And then it was also warmer than I thought it would be. I ran out of water and went to refill at the water fountain in this park that is about 2.25 miles away from my apts, but they had the water fountain turned off and the bathroom closed for “winterization.” Seriously? It was practically 70° out. I did eventually find an operable water fountain a little more than a mile from my apts. I REALLY need to be all about that hydration on days before my loooooong runs. This is the second time I’ve done this to myself. I don’t want it to happen again. 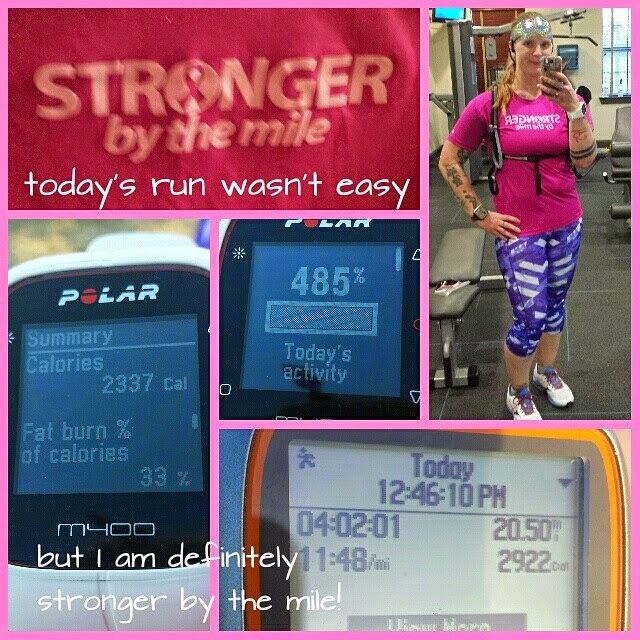 • Monday: just a short run…3 miles. That’s what I had planned to do, but even if it hadn’t have been, that’s all I would have done. I slept horribly due to being woken up multiple times and then not being able to get back to sleep due to some GI distress and cramping. I didn’t push myself at all in this run and I was really hoping it would purge me of the yuck feeling I had (as it has done in the past), but it didn’t. • Tuesday: had a really good night’s sleep, so woke up feeling great. 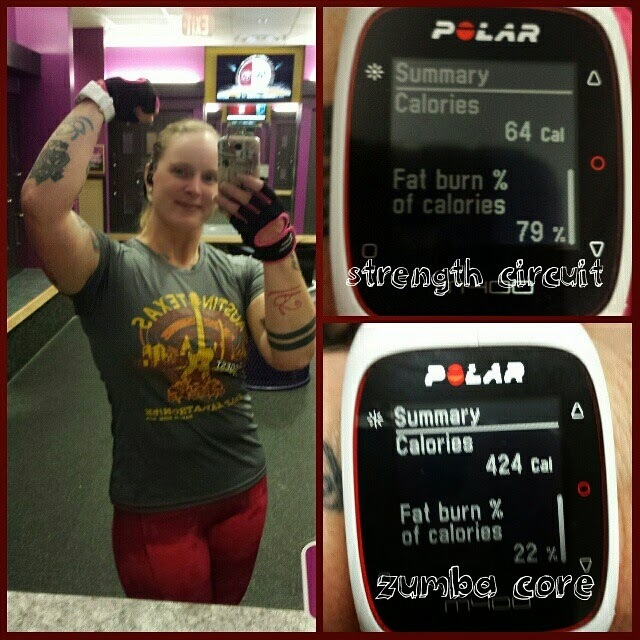 I went to the gym and did my strength circuit. I upped the weight on a few of the exercises because I noticed on Saturday that they were starting to be easy. This coming Saturday, I’m going to start doing 3 rounds of the circuit training area machines. 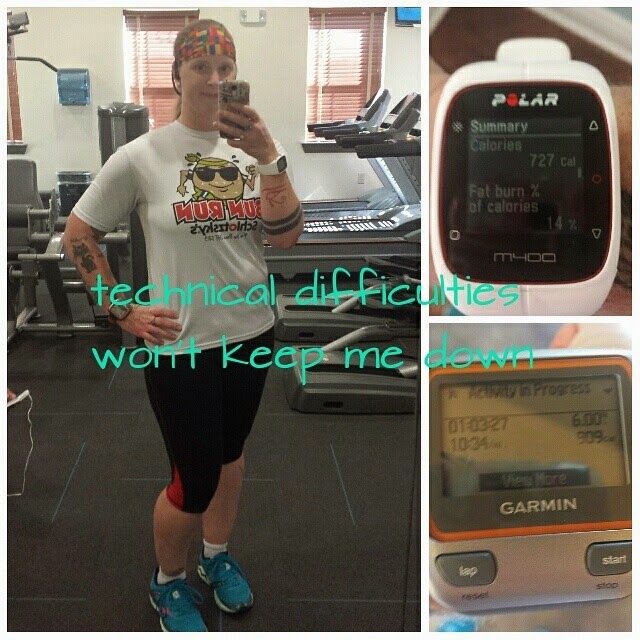 • Wednesday: had some technical difficulties that delayed me this day. I got up, got dressed and headed up to the front of my apartment complex to warm up for my run. Turned on my Garmin and my M400 so they could both find satellite signal. My Garmin promptly told me it was dying. Ugh. So I went back to my apartment to charge it. I set my timer on my phone for 45 minutes. At the end of 45 minutes, I unplugged the Garmin from the charger and headed back up front to warm up and then run. I should have adjusted what I was wearing for my run, and went from a tech shirt to a tank top. 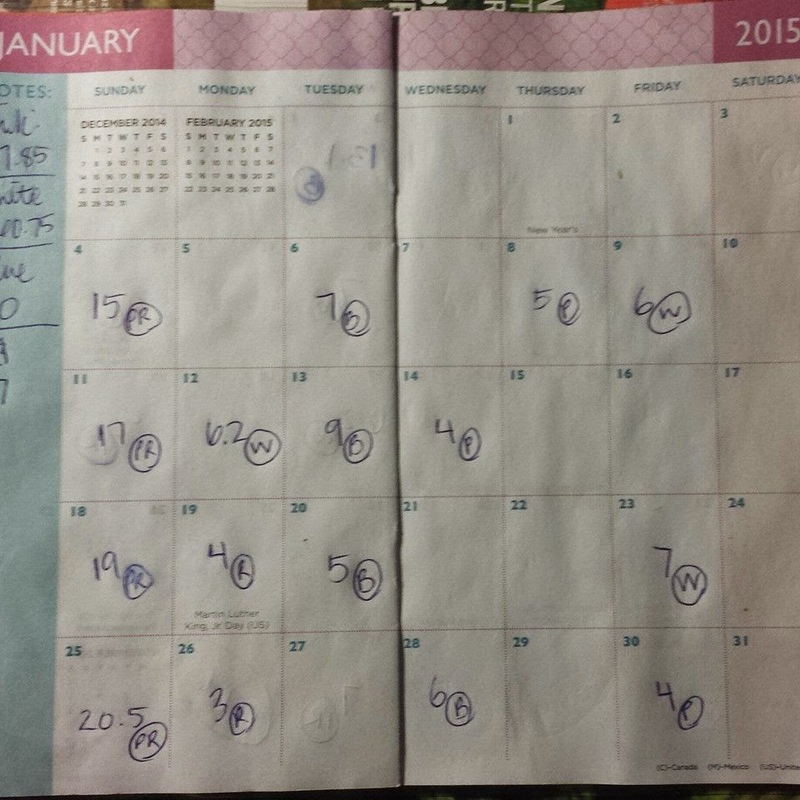 because by now it was a good probably 8° warmer than when I had originally planned to start running. Oh well…that’s what I get for not checking the temp before heading out. Lesson learned. • Thursday: worked a double shift Wednesday night so no workout this day. • Friday: got a really good 4 mile run in this week. A great way to end January. 137.7 miles for the month. WOO! 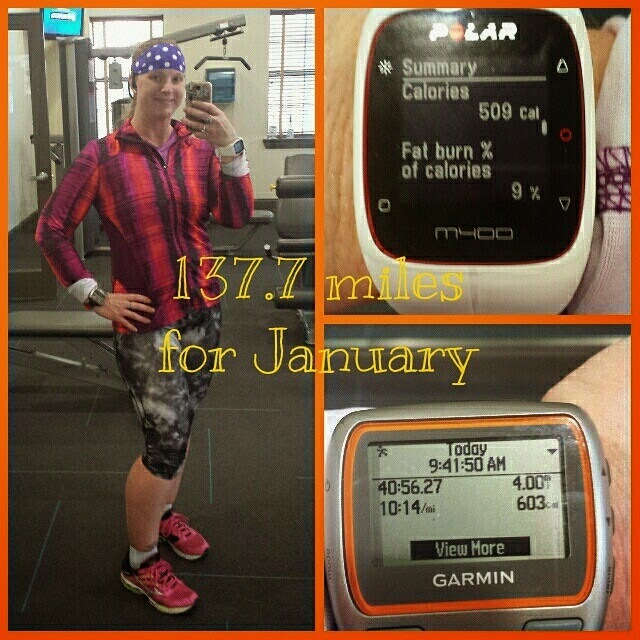 I ran 137.7 miles in January! What a great way to start off 2015! 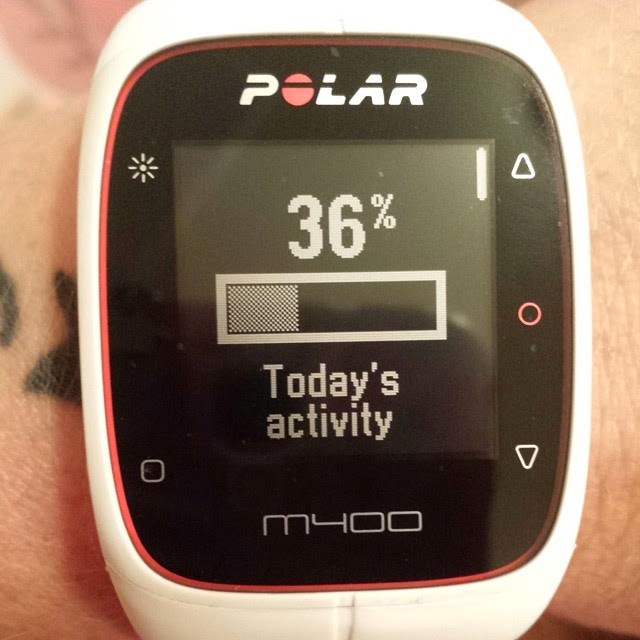 The more I wear my Polar M400, the more I’m in love with it. 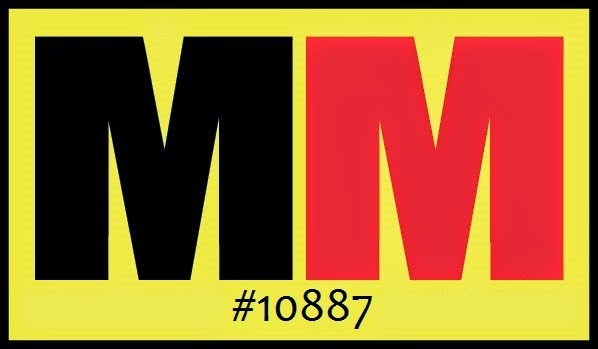 I have transitioned from wearing my regular watches to pretty much wearing only the M400. I love that it tracks my sleep too and tells me the percentage of good sleep I had. 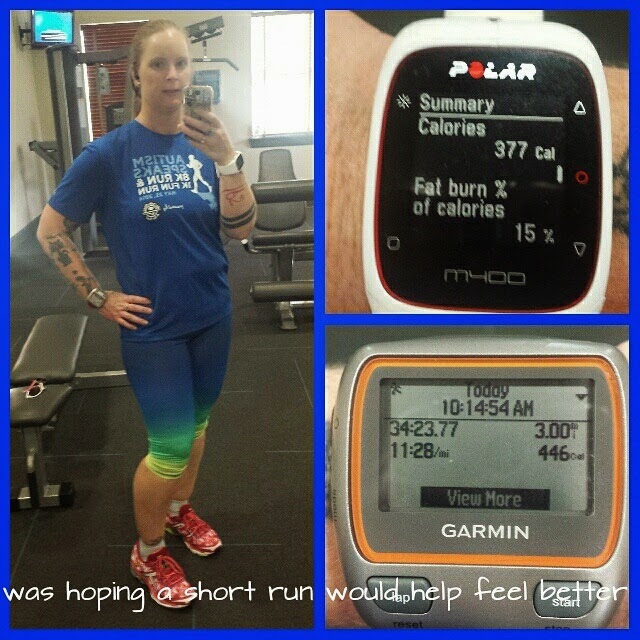 I’ve also been wearing it on my right wrist while I run, the Garmin is on the left wrist (as I’m sure you’ve noticed in my workout photo collages that I have both of them in the pictures now). Eating-wise, all was bueno again. Saturday, even though I’ll usually splurge on something simply because I weighed in that morning and have all week to burn it off, I didn’t. I went to the store and got me an 8 oz salmon filet, seasoned and baked it and then had a salad on the side. Sunday, since I knew I was running 20.5 miles, I had planned to get ¾ lbs of brisket from Rudy’s BBQ, some banana pudding, a giant loaded baked potato and a cherry-berry pot pie. What happened was just the brisket and banana pudding. So that left me with a calorie deficit of around 2000. I know they say not to leave yourself with a deficit of over 1000, but I just wasn’t hungry and I’m not going to force myself to eat when I’m not hungry. I *JUST* got my binge and over eating issues under control…why am I going to force myself to eat when I’m not hungry? I’m not…so, potato and pie saved for another day. I had some moments of snackiness this week. What I mean by that is that I had some urges to eat when not hungry due to boredom and frustration at the clock for not moving faster while I was at work. Haha. Like stuffing my face with food I don’t need and that I’m not even hungry for is going to help remedy either of those things. But I didn’t give in by eating more food than I had planned on eating those days…all I did was just eat some of the foods I had already planned on eating earlier than I had planned on eating them and that satiated me and I went on with my day without any more issues. So, urge to eat when not truly hungry satisfied without derailing myself and doing any damage to my eating plan. 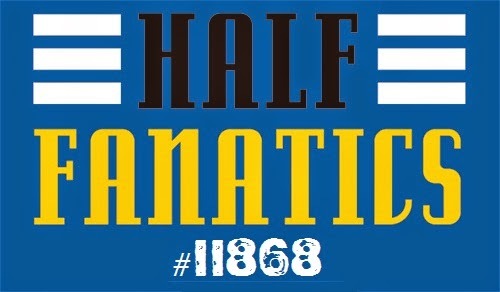 I’d say that equals a success! Or, as they say, a non-scale victory! I had a friend ask me how my beef tikka masala dish that I made this past Sunday turned out. I have to say, one of the tastiest dishes I have made to date. I’m excited to make the other 2 recipes I have for the tikka masala and see how they compare. But, unless one of the other 2 just knocks my socks off, I see myself making this one again and again. I may never have to go to a restaurant for my tikka masala ever again. That’s how good this stuff is.